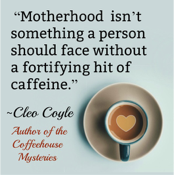 This week we have a review of the latest coffeehouse mystery by Cleo Coyle, and a fun Mother’s Day guest post by Cleo. 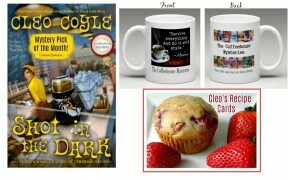 Details at the end of this post on how to enter to win an amazing giveaway from Cleo Coyle which includes a first edition signed copy of Shot in the Dark, an autographed set of Cleo Coyle’s collectible recipe cards, A Coffeehouse Mystery mug with a favorite saying of Clare’s octogenarian employer Madame: “Survive everything. And do it with style,” and a mystery prize. There is also a link to purchase the book from Amazon, and an indie bookstore where a portion of the sale goes to help support KRL. A new dating ap has the Village Blend coffeehouse in New York buzzing with couples trying to find the perfect match. While Village Blend manager Clare Cosi isn’t completely thrilled with them becoming a hookup hotspot, she enjoys the extra traffic, and keeps the coffee and delicious pastries coming. Her ex-husband, Matt, who is also the coffee buyer for the shop, has also become addicted to using the ap. Things take a terrible turn when one of her customers is threatened with a gun by one of the girls that he tossed aside after connecting with her through the ap. The shop suddenly becomes a crime scene which hurts business. Things get even worse when the guy turns up dead and the police are convinced the girl is the killer. Clare isn’t really convinced, and neither is one of her barista’s Tucker who knows the girl. Clare sets out to find the real killer to not only save the girl, but also her coffeehouse. She is also preoccupied with finding a venue for her wedding to cop Mike Quinn, and worried about her daughter Joy who sends her a cryptic message needing to talk. This is a delightful series! Every time I pick up a new book in this series I feel like I am returning to my favorite coffeehouse–sometimes I would even swear I could smell the coffee. Clare is strong, curious, smart, and determined. Every character in this series is full of personality-from the quirky baristas, to Clare’s charming ex-husband, to the owner of the Village Blend (who is also Matt’s mother). The mystery is filled with twists and turns, and even another body. The behind the scenes world of dating aps was interesting as well. The cream on the top are several delicious coffee and pastry recipes in the back. So grab a cup of your favorite coffee, bake some of the delicious pastries in the book, and sit down and enjoy this latest coffeehouse mystery. And if you haven’t read the other books in the series, you had better brew some extra coffee and get busy! For fifteen years and seventeen books, our Coffeehouse Mysteries have featured the struggles and triumphs, heartbreaks and joys of three generations of women—a mother, a daughter, and a grandmother. Over the years, we’ve heard from readers who themselves are mothers, daughters, and grans. They tell us they love our books and pass them from one to another. Why? Because, at their heart, our Coffeehouse Mysteries involve much more than intriguing crimes. Our stories also explore the ups and downs of relationships, including and especially motherhood. Our amateur sleuth, coffeehouse manager Clare Cosi not only acts as a mother hen to her quirky staff of baristas, she’s also a real mother to a young adult daughter, and she continually struggles to do the right thing where Joy is concerned. No easy feat since the girl is no angel. But, really, when it comes to defining yourself as separate from your parents, what teenager is? The dilemmas we set up for Clare and Joy are never easy or identical. In one book, Joy’s bad decisions nearly get her killed. In another, her immature choices land her smack in jail on suspicion of murder. If you were her mother, what would you do? As the series progresses, Clare and Joy’s relationship does, too. The Coffeehouse Mysteries trace a long, beautiful story arc between mother and daughter. Readers have cried with them, laughed with them, feared with them, and even baked with them, while always feeling their frustrations and affection for each other. Likewise, Madame, the octogenarian owner of our landmark coffeehouse serves an important role in our stories. Technically, Madame’s relationship with Clare is as an employer (and former mother-in-law). But on a human level, she’s the mother and mentor that Clare never had, and readers adore her. We do, too. 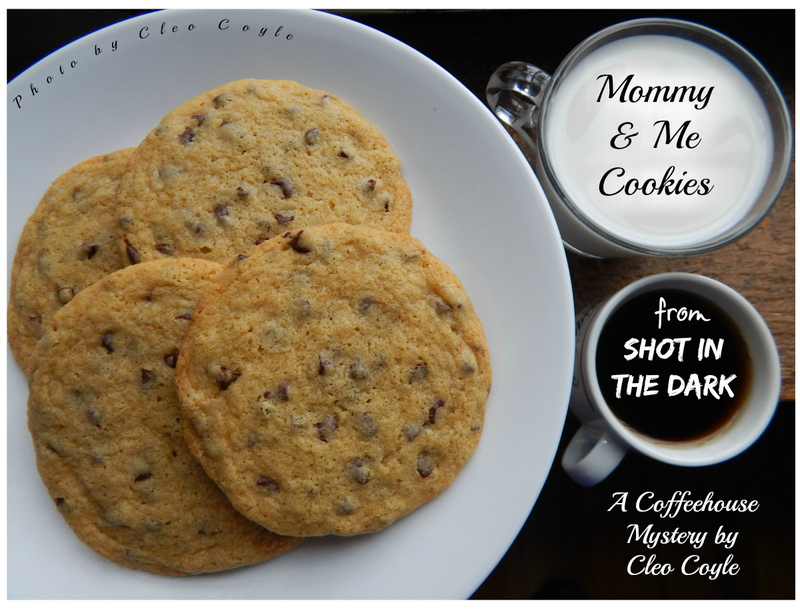 So Happy Mother’s Day to Clare, Madame, and the many women readers who’ve become fans of our long-running Coffeehouse Mystery series. Whether you’re a mother, a grandmother, or a mentor, we salute you for striving (like our beloved Clare) to do good things in a bad world. 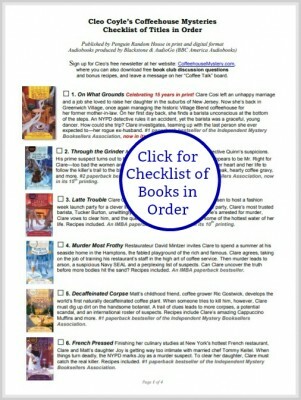 Get a title checklist with mini summaries of all seventeen Coffeehouse Mysteries with links to Cleo’s Free Recipe Guides and the six titles of her Haunted Bookshop Mysteries. To download the list as a PDF document, click here. 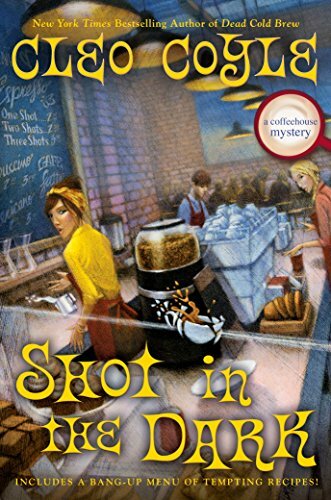 Cleo Coyle’s latest bestselling Coffeehouse Mystery, “Shot in the Dark,” is also a culinary mystery, with an appendix of more than twenty-five recipes. 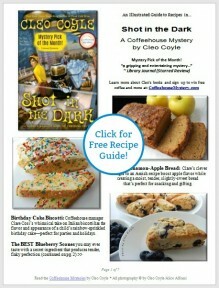 To get Cleo’s Free Recipe Guide, click here or stop by her online coffeehouse at CoffeehouseMystery.com to download a free copy. Visit Cloe’s website at www.coffeehousemystery.com. You can also friend or follow Cleo on Facebook as well as Twitter and Pinterest. 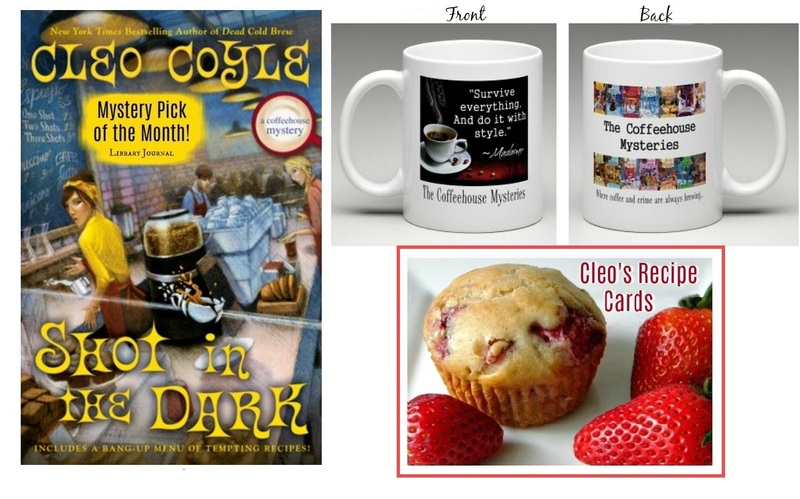 To enter to win this amazing giveaway from Cleo Coyle which includes a first edition signed copy of Shot in the Dark, an autographed set of Cleo Coyle’s collectible recipe cards, A Coffeehouse Mystery mug with a favorite saying of Clare’s octogenarian employer Madame: “Survive everything. And do it with style,” and a mystery prize-simply email KRL at krlcontests@gmail[dot]com by replacing the [dot] with a period, and with the subject line “coyle giveaway,” or comment on this article. A winner will be chosen May 19, 2018. U.S. residents only. If entering via email please include your mailing address, and if via comment please include your email address. Cleo Coyle is a pseudonym for Alice Alfonsi, writing in collaboration with her husband, Marc Cerasini. Both are New York Times bestselling authors of the Coffeehouse Mysteries, now celebrating fifteen years in print, multiple starred reviews, and the thrill of being featured as a Jeopardy question. Alice has worked as a journalist in Washington, D.C., and New York City, and has written popular fiction for adults and children. A former magazine editor, Marc has authored espionage thrillers and nonfiction for adults and children. Alice and Marc are also bestselling media tie-in writers who have penned properties for Lucasfilm, NBC, Fox, Disney, Imagine, and MGM. They live and work in New York City, where they write independently and together, including the popular Haunted Bookshop Mysteries. Look for a brand new entry in their Haunted Bookshop Mysteries this October: The Ghost and the Bogus Bestseller. Awesome series. Interesting. Thanks for the review. I love this series and am really looking forward to reading this newest book! Thanks for the great book review and giveaway! Happy Mother’s Day! Cleo Coyle writes about one of my favorite subjects, coffee!! I love the title. Thank you so much for this giveaway! I enjoy the Coffeehoude mysteries. Always great reads with good recipes and you get to learn about coffee too. I am such a huge fan of the Coffeehouse Mysteries and have been since the first book. I think it’s because I’m a big fan of coffee. I love the recipes included in the books and the coffee tips too. I can’t wait to read about the new adventures of Clare and to see how everyone else in the Coffeehouse world are doing. After all these books, I feel close to everyone and if I lived in that world, I would hope I would be friends with them. I would love to win a signed book and all of the other great prizes listed. Your a great author . Thank you for being gracious. I love Cleo’s stories and would love to add another one to my collection. Her recipes are also yummy. What an awesome giveaway! Thank you so much for the chance! I’ve enjoyed each book and newsletter! The recipes are a pleasant bonus. Keep writing and I’ll be happy! Looking forward to reading this book. Cleo is my favorite mystery writer! Drinking coffee while reading about Cleo and Mike and company is my favorite thing to do. You two are so cute! I bet working together and being married isn’t always easy, glad you do it though. I spent 2 1/2 hours with Peter Noone (Herman Hermit’s concert) and got to meet him and take a picture with him. I was also able to make my mouth move and words come out! Wonderful Mother’s Day with my husband. Please keep writing this series! Have read every book of this series. I hope the Coffeehouse Mysteries continue for a long time. I love this series and can’t wait to read this new book! As if SHOT IN THE DARK wasn’t an intriguing and appetizing title to read, I am blown away by the “Survive Everything” mug giveaway. Being a 3-time cancer survivor, this mug says it all for me. You are truly awesome, Cleo Coyle (Alice Alfonsi). I am more and more intrigued by this new book and can’t wait for it to come in at the library (I’m 4th on the hold list)! Talking about your books, coffee and recipes with my beloved Jazzercise girls are one of the best parts of the series! Happy Mother’s Day! I love everything about these books. This is one of my favorite series. I can hardly believe we are at book # 17 already. Most of the time, in a series this long, the books tend to recycle story lines and get a bit drab. Not so with this series. I can’t wait to get my hands on this newest installment and catch up with my favorite baristas and coffee aficionados. Loved when the reviewer said “sometimes I would even swear I could smell the coffee”, that’s exactly how I feel when I’m reading these books. Love this series and I hope it continues for a long time! I love your books and humor. I think you will find me only half human. I love the smell of coffee but hate the taste. Love Shot In the Dark . Another best seller. Thank you ? I love the coffeehouse mystery series. These books are great fun. I always look forward to a new one and can’t wait to read Shot in the Dark. I really enjoy this series. There were 5 books when I found this srries. It’s great plots, believable character development, and fantastic recipes keep me coming back for more!!! I love the Coffee House Series! I’m really hoping to win the contest and get the new book. I love your books. I’ve read every one. Thanks for such wonderful stories. Happy Mother’s Day. Sounds like Great cozy mystery. Love the fact that this mystery takes place at a coffee shop. Of course Shot in the Dark is an awesome book. All the Coffeehouse Mysteries are a fun and exciting. My favorite cozy books. I’m ready to start the whole series again!!! Love the books. Can’t wait to read the new one! Thanks for the great series! Reading murder mysteries help me stay sane. I need caffeine to keep up with my mom. Happy Mother’s Day Cleo! Just finished your fantastic vook, Shot in the Dark! Sincere appreciation! I love this series and would love to win this great prize! I absolutely LOVE your books and can’t wait to read the latest. Very excited to read this next installment in the series. Will be starting “Shot in the Dark” this evening! Thank you for the giveaway. I love this series and can’t wait for the next book. I love Cleo Coyle’s coffeehouse mysteries. They are my favorite cozy mysteries. Love this series and can’t wait for the newest one!! I love Clare and the Coffeehouse series! Always a great read and a great mystery! The recipes are wonderful. The character development has continued so well, you start to feel like you’d hang with the VB gang! I’ve never been to NYC, so it gives me a tiny taste of the Village. I’ve never one anything…hope this time I’m lucky! I’ve followed this series since the beginning. coffeehouse. Just like real-life family. Can’t wait to get the newest installment. Looking forward to this newest in the series. Always love when the new books come out! I adore this series & the yummy recipes! Can’t wait to get started reading! This is one of my favorite book series. I go through withdrawals as soon as i finish these books. Maybe I need to start the series over??? It is Mother’s Day winding down. I just finished reading A Shot in the Dark and thoroughly enjoyed it. Forget the dating app. I want a magic app that delivers fresh coffee and goodies! I love this series! As soon as a new book comes out I devour it. I truly love the interaction between the characters, especially Esther and Tucker. It’s great to see that Joy is back in this new installment. My absolute favorite thing about all of these books is how up to the minute the writers always are with current trends. I’ve been reading this series since the beginning, and I still look forward to each new book with excitement and enthusiasm. The series just gets better! Can’t wait to get Shot in the Dark. Kchinetti at gmail dot com. I’d LOVE if you could eventually put “ALL” the recipes into a Claire’s coffeehouse cookbook! Always love a new cookie recipe, c. Of coffee, and a good book. Cat wait to read this newest Coffeehouse Mystery. I now enjoy trying new types of coffee from reading the books. Love this series! Thank you for the chance to win. JUST FINISHED A SHOT IN THE DARK. AS USUAL I LOVED IT. CANT WAIT FOR THE NEXT ONE!!! HAPPY MOTHERS DAY !!!! I’ve read every book in this series. They are good. I love this book series and am very excited for my summer read! Have so enjoyed your coffee house series Looking forward to Shot in the Dark. Looking forward to reading “A Shot in the dark”!! Wonderful article about a great series. As you read the Coffeehouse Mysteries you will feel as if you are entering the coffeehouse and smelling the wonderful aromas of freshly brewed coffees. Keep the books (and recipes) coming! I enjoy your books and your recipes are mouth-watering. I look forward to your newsletters. Thank you! Love this series! Can’t wait to read the newest book Shot in the Dark. I have adored every Cleo Coyle from every series I have read. The giveaway is fabulous. Bon chance to everyone but fingers crossed I win. I love this series! Always look forward to reading it! What a great article. I love the coffeehouse mysteries. Looking forward to the new one. This really sounds so good, each time I read more about it!! Thanks for the great review. This is one of my favorite series and I love can’t wait for the next entry. Great characters and believable plots! One of my favorite series and what an excellent prize pack! Hi, just wanted to say i adore the coffee house mystery series. I love the characters and the recipes. I don’t even drink coffee but these books make me want to be a coffee conisuer. I live on long island so i get out to the city as much as i can. Thats one of my favorite parts of these books. There set mostly in NYC and I’ve learned alot of cool things about the city cause of these books. Plus the review was great too. Literally can’t wait to read a shot in the dark. One of my favorite series! The characters are engaging and the recipes are delightful! I love these books…love a long ongoing series. Clare and crew feel like old friends I catch up with whenever a new book is out! I love the Coffeehouse Mysteries — it is definitely one of my very favorite series. Each mystery is new and fresh, and I love to visit The Village Blend and see Clare and the gang — I may even get a glimpse of Madame! Thank you so much for the giveaway! I love this series! Really looking forward to reading “Shot in the Dark”. Thanks for the chance. I have just recently discovered the Coffeehouse Mysteries. I LOVE them. I am on book 6 and just started with book 1 the end of April!! Can’t get enough “coffee” I guess! I’ve already finished reading A Shot in the Dark, and have picked out my first recipe to try. Next book I’m waiting for that wedding! Love Cleo Coyle books! Thanks for a chance at this prize! I’m looking forward to reading Clare’s latest adventure! Such a fun series. I have read all of the series so far and have really enjoyed them. I have learned a lot about different types of coffee. Absolutely hooked on this series! Looking forward to reading Shot in the Dark! Thank you for doing the giveaway! Enjoy the series so much and appreciate the recipes and all the coffee info. The Coffeehouse series has been a top favorite of all time for me. I have not missed even one book in this series, and have told everyone that I can think of about it. Cleo is so wonderful with her readers and that has made a big impact on me and made me want to read this series even more than was already a ton. I enjoyed your review KRL and always do. Thank you. I’m not putting in for the giveaway but I did want to mention how wonderful I find this series. Now, I must go have a tall glass of cold brew coffee that I made last night from Cleo’s instructions. Thank you. I’ve been reading the coffeehouse series for years and Claire, Matt, Madame, Joy, Manny, Mike, and the rest of the gang are like old friends now and I look forward to each new book being released. I think Shot in the Dark was one of the best (if I could pick a ‘best’ … love them all). Looking forward to reading the story and making the pork tenderloin wrapped in bacon. I think my family will like it! Love these books! Looking forward to the next adventure! I love this series. It never fails to entertain. I can’t wait to read the new book! I ove this series! Can’t wait to catch up with Clare Cosi. Thanks for the chance. Happy (post) Mother’s Day mama’s! May I just say that while I’m happy to report that the mama’s and daughters in my family have not had to solve any murders, I’m a bit envious of all the great food and wild adventures Madame, Claire, and Joy have experienced. They’re always inspiration though; I am grateful that their recipes and reminiscences are shared. I Love the Coffeehouse Mysteries! Thank you for the chance to win such an awesome prize. Love this series! Thanks for the chance to win. I’ve read everyone of the Coffeehouse Mysteries . Cat pick a favorite. As a coffee and cozy lover I can’t wait for each new book. Great review and article! Exited to read this book because this is my favorite series. Always great mysteries and wonderful recipes! And Coffee , wonderful coffee! I’ve learned so much about how it goes from bean to a great cup of coffee! Looking forward to the newest edition! I really enjoy reading about Clare, her family and the beautiful coffee house! Love Madam’s new boyfriend. Hope the character comes back in future books.